You might have heard of the following terms - 'alternative healing systems', 'energy healing', 'energy medicine'. Pranic healing is one such scientific energy healing practice. Some people, unfortunately, liken it to magic or witchcraft. Today, I wish to explain why Pranic healing is not black magic. To quote the famous Albert Einstein, light and matter are just aspects of the same thing. The matter is just frozen light. And the light is a matter on the move. He said: "Everything is vibration". All matter is merely energy condensed to a slow vibration. Positive thought is simply vibrating at a higher frequency. If Pranic healing is not black magic, what is it? Pranic® healing is a scientific system of energy medicine (or healing). In this, a healer uses the hands to remove blockages from the energy body (aura or magnetic field). Then he/she provides high-frequency vibrations to increase the flow of energy in a certain area of the aura. The cells of the physical body then absorb this energy and use it to vitalize themselves. Thereby, the functioning of the cells is restored to good health. A knife can be given into the hands of a criminal to destroy life, or into the hands of a surgeon to save lives. The same knife can also be used differently. So is the case with energy. There is a saying that energy follows thought. And Energy can be projected with an evil intention or with a positive thought. 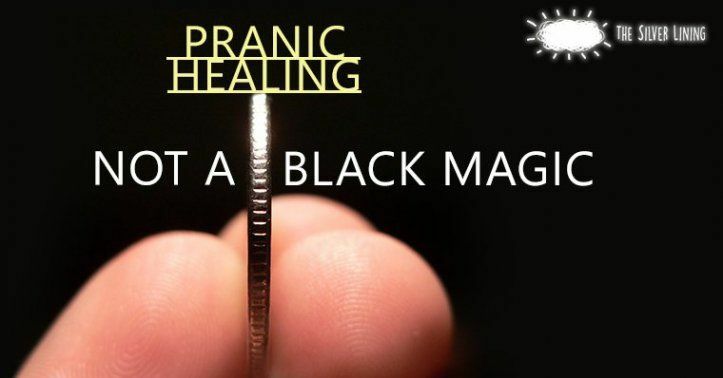 Why Pranic healing is not black magic? Pranic healing is white magic. It uses energy to heal and restore balance in the magnetic field or aura of a living being. Black magicians use the same energy but with a negative intention to destroy or harm living beings. The power of a white or black magician depends on his/her ability to draw in energy or prana and direct it with the power of thought. Pranic healing is not black magic. It is just a way to remove blockages and balance the aura, restoring it to its proper functioning. All Pranic healers are forewarned of the serious negative karmic implications if the techniques for healing are misused irresponsibly. So there is very little chance of people getting hurt or harmed by pranic healing. This art of healing is taught as a science with specific techniques that need to be strictly adhered to. It requires following step by step instructions. A safe and easy, yet powerful system of healing, Pranic healing is a gift to humanity by the Teacher Grand Master Choa Kok Sui. Any person with average intelligence and a good heart can learn to heal themselves and others by learning and following the simple Pranic Healing techniques. I trust that I've been able to explain why Pranic healing is not black magic and is not at all related to such dark practices! It actually encourages everyone to evolve through service to fellow living beings. And in doing so, it helps people to gradually manifest their greatness! This article was contributed by Mrs. Tehruna Meresh. Mrs. Meresh is a professional Pranic healer @ Life Positive. She is a passionate healer with almost 22 years of experience in transforming people's lives. To address mind, body, relationship, and other well-being issues, connect with her and learn more about her on her page.